Bake Chocolate Salted Caramel Cupcakes for a delicious chocolatey treat. These salted caramel cupcakes are as cute as they are tasty and easy to make. Prepare cake batter and bake as directed on package for 24 cupcakes, blending 1 pkg. dry pudding mix into batter before spooning into prepared muffin cups. Cool cupcakes in pans 10 min. ; remove from pans to wire racks. Cool completely. Use small sharp knife to cut 1-1/4-inch-wide hole in top of each cupcake, being careful to not cut through to bottom of cake. Fill holes with caramel topping; cover with cupcake tops. Melt chocolate as directed on package; cool slightly. Beat remaining pudding mix, milk and powdered sugar in large bowl with whisk 2 min. ; stir in COOL WHIP. 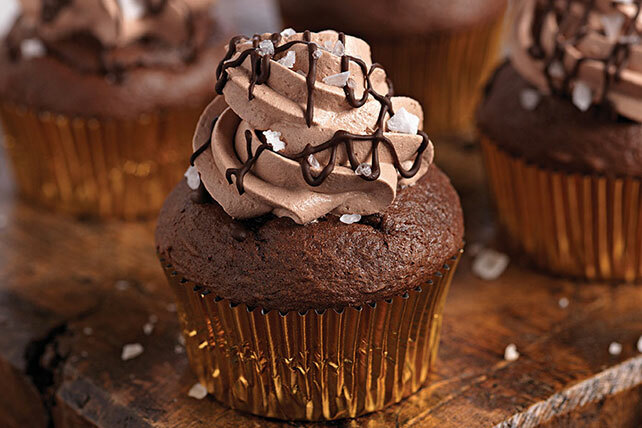 Spread frosting onto cupcakes; drizzle with chocolate. Sprinkle with salt.